Ever feel like the great northern parts of the Houston metropolitan area are art-free? Actually, there are a few artistic outposts north of the north Sam Houston Parkway--the Pearl Fincher Museum of Fine Arts up in Spring, and the Kingwood LSC art gallery (open during the day from Monday to Friday, which pretty much excludes anyone with a job from ever seeing the exhibits...). I'm sure there are artists up there, toiling away in their studios. What else? It's no surprise that the Woodlands is home to a bunch of plop art. And now there is a guide. A guy named Anthony Motto has put together a book and a website cataloging the public art of the Woodlands. From the moment I laid eyes on this particular statue, "On the Shoulders of Giants", it has been my goal to contribute something that would build an awareness and appreciation for each and every outdoor sculpture that resides in The Woodlands, Texas area. 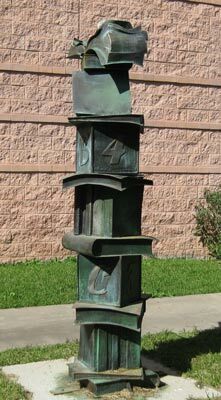 The Woodlands outdoor sculptures collection is one of the largest collections of outdoor sculptures for a community of its size in the continental United States. There are numerous unique sculptures situated throughout The Woodlands area. It is my pleasure to present this massive collection of artwork here in a virtual tour format. So is it worth a trip to the Woodlands to check out this sculpture collection? Eh, maybe not. Most of it seems pretty uninspired--the kind of inoffensive, bland sculpture that manages to get past some selection committee. (The perennial problem with plop art, really.) But there are a few pieces I liked. This one is colorful and playful, which are qualities I like in public sculptures. Ultra-playful. A little like Jim Love's Trojan Bear. This was the Woodland's first public sculpture, one that I suspect most visitors to the Woodlands have seen. I like the repeating pregnant curves in it. So all this makes me wonder if it is legal for a private citizen to put a sculpture in their yard in the Woodlands. Remember, the Woodlands, unlike Houston, has strict zoning rules. So a private sculpture might not fly. I'm not sure that the sculpture of the Woodlands is worth a special trip, but if you are going to the Woodlands anyway, check out this website and pick some sculptures you want to see while you are there. Most of Pebworth's are hideous anyway. I look at them and wonder how much he got paid for that junk. I could do WAY better at half the $$ I bet.